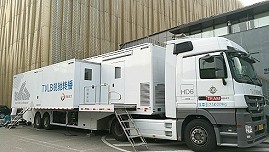 TVLB offers UHD OB production vans in Beijing and China. Beijing, September 2018: Touch Video Live Broadcast (TVLB) is a major broadcast services company in China that offers UHD production facilities. It has two UHD OB vans, as well as four HD OB vans. New to promoting its services on TVZ, TVLB has been operating for 16 years and is one of the largest private broadcasting solution providers in the country. It's the host broadcaster for the Chinese Super League and the national soccer team games. It also broadcasts WBA and a large variety of other sporting events. or visit the company's listing on TVZ.